Do You SuDoku ? New V2! Award Winning** Mastersoft SuDoku* V2. Jump on board with the New World Craze Puzzle Sensation ! Not since Tetris© and the Rubik Cube© has there been anything like it. Simply enter the digits 1 to 9 in the grid without repeating in rows, columns or boxes. Easy. It will be one of the greatest puzzle games for the pocket pc... Rated 9.5/10. While there is now a plethora of SuDoku games ... I can't think of any that comes with as many functions to help you play the game as Mastersoft SuDoku. This game will definitely be a hit. I truly enjoyed the challenge offered by this brain teasing puzzle. After playing just a few games I was addicted to it... Rated 92/100. No review can really give this game the justice it deserves. This is one game I don't want to be without on my Pocket PC. A definite buy... Rated 9/10. Winner 2008 - Handster Best Software Awards. Winner 2008 - Pocket PC Magazine Awards. Winner 2007 - Pocket PC Magazine Awards. Winner 2005 - HP iPAQ Choice Awards. Now just one version that works with VGA, QVGA and Square Windows Mobile or Pocket PC devices. New V2 with countless new features and full VGA/Square compatibility. Over One Million Built In Genuine SuDoku Puzzles !. If you need more let us know ! Many Unique Mastersoft Features including Picture Sudoku and Grid Transform. SuDoku Solver - Solve any SuDoku puzzle in less than 3 seconds ! Create, Solve and Analyze SuDokus. Work your way up from Beginner to SuDoku Master ! Enter a SuDoku from a newspaper then either solve or play (using inbuilt hints if required). Mastersoft SuDoku tells you where you're going wrong even if it isn't an inbuilt SuDoku ! A Quality Title Endorsed by the HP iPAQ Choice Promotion. Cool scoring system. Can you become a SuDoku Master ? Using hints will of course reduce your score and you'll need a certain number of points to reach the higher levels and unlock Picture SuDoku ! New (V2) Find Triplets, Quads, X-Wings, Swordfish and Jellyfish ! VGA, QVGA and Square QVGA compatible. Choose from a full pallette to color code your entries. "SuDoku Master" levels that are more difficult than the hardest SuDokus found in newspapers. Unique gameplay with increasing difficulty. Designed with the help of over 200 SuDoku Players. You think it we'll make it ! Lots of options such as turning sound off, hiding timer and score etc to aid concentration. 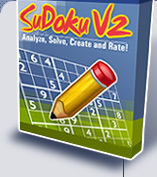 SuDoku has now been updated to V2 however V2 is NOT a free upgrade. If you wish to upgrade then please use the upgrade offer at the top right of this page. This upgrade offer is only available from our website. V2 is suitable for all Pocket PC and Windows Mobile devices including VGA, QVGA and Square 240 x 240 (eg Treo 700, hw6515). We promise you that after just one go you will be hooked on this fantastic 200 year old Japanese conundrum. NB This product uses Version 1 SP 3 of Microsoft's Compact Framework Technology. This is included in the ROM of most devices. If you experience problems with 'MISSING COMPONENTS' then please install Version 1 SP3 from HERE. **Source: HP iPAQ Choice. Winner of 2005 iPAQ Choice Awards (Entertainment Category).